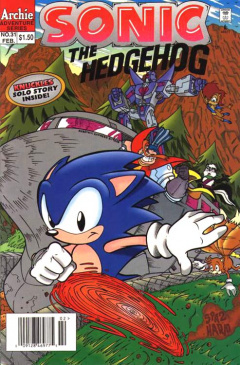 Sonic the Hedgehog 31 is the thirty-first issue of the Sonic the Hedgehog comic. This comic features two stories: A Robot Rides the Rails and Tundra Road. This issue also features the Knuckles' side-story Lost and Found, the first Knuckles solo story that becomes a common staple of the comic. Sally Acorn is taking matters into her own hands, infiltrating Robotropolis on her own with NICOLE in hand. She connects NICOLE to a port in a wall to access a specific type of information. NICOLE locates the information, but it consists of a lot of data. Sally's not surprised, based on the rumors she has heard about it. She hears a whistle, so she decides to leave. She disconnects the link, while NICOLE activates a radio link so she can download the data while Sally runs from the area. She reaches a bridge over a railroad track, with a train approaching that Sally must board. Standing on the rail of the bridge, she prepares to jump, concerning NICOLE. Despite its protests, Sally jumps and lands on the locomotive, causing NICOLE to further complain about having fun when she's supposed to be gathering data. As the train continues on, Sally tells NICOLE that, as Freedom Fighters, they must be ready to respond to anything at a moment's notice. NICOLE, on the other hand, is concerned about a lack of back-up. Sally reminds her friend that they do have a back-up: Rotor is tracking NICOLE's signal back at Knothole in his lab. In the lab, Rotor watches as Sally's position appears on a display. Rotor is able to deduce that Robotnik is shipping his newest creation, the Dynamac-3000, ahead of schedule. This confuses Sonic, who asks what this creation is. Rotor answers, stating it's Robotnik's newest super robot that can control the western portion of the continent. Sally went in alone, wanting to check it out personally. With NICOLE in hand, Sally could get all the information they needed on this new threat. Sonic, however, is concerned for Sally and wants to help her out personally. He heads off, although Rotor tells him to stop, but he ignores him. Rotor then goes to the remaining Freedom Fighters and tells them to go to the hangar. They all board a plane, the one they used previously but upgraded with new improvements. With Antoine at the helm, they head off to help Sally. Back on the train, Sally climbs down into a cab car, opening the door and sneaking on board with caution. She enters a large cabin where a yellow humanoid-shaped mechanical being is laying down in the middle of the floor. She takes out NICOLE to scan it, but she is unable to due to an unknown dampening field. She then realizes that someone is interfering with her scans, just as a hand appears, muffling her. Sonic, meanwhile, has located the train and has no problem catching up to it despite its fast velocity. He starts catching up with the locomotive, but a laser on the roof of it locks onto him, firing and hitting him. Sally looks back at the unknown figure, revealing that the figure is actually Geoffrey St. John, a friend from before. Geoffrey takes his hands off Sally, while she asks him why he did that since they are friends, and why he's on the train. He reveals that he, like Sally, is also working to stop Robotnik from preparing his new robot, along with his own Freedom Fighters. Outside, Sonic gets up, still woozy from the blast, though realizing that it could only come from a SWATbot's laser. He's still too woozy to chase after the train, so he flags down the Freedom Fighters' plane to pick him up. They see his waves for help, but, unable to land, Rotor decides to drop a ladder down and grabs Sonic while they fly by. With Sonic in tow, they pursue the train and are able to catch up. As Sonic is able to get off the ladder, he decides to jump onto the train to help Sally himself...even if his effort could end up killing him. As Geoffrey mentioned about his own group, Sally asks him where they are. They are currently in the locomotive, preparing to shut down the train. As if on cue, the emergency brakes are activated, causing Geoffrey and Sally to fall to the ground. They look up to see alarms going off, making Geoffrey realize that his crew have set off a fail-safe when they cut the train's power. Not only that, but the fail-safe has activated the robot in the cabin. It gets up and prepares to confront the two, while Sally asks NICOLE for advice. The only advice it has is to retreat until they have back-up. Sally, however, is adamant to run. Outside the train, Sonic prepares to jump, but to save him the hassle, Tails flies down and grabs him, giving him a safe lift onto the train. He starts running up the train to find Sally, until he's stopped by the robot punching through the roof of the train car. It pops up as Sonic enters into a spindash to take down the Dynamac-3000. His efforts are futile, as the attack fails and he's rebounded into the train car. Sally and Geoffrey run over to help, whom Geoffrey initially calls Sonic out as one of Sally's trainees. Sonic takes offence to the statement as he gets up, but they have bigger problems, as the robot starts to transform. It turns into a spider-like form, using two arms to grab the Freedom Fighters' plane, which gets too close to the robot. Geoffrey takes out a gun, still thinking Sonic is an amateur, claiming he can take care of the robot. Sonic gets further angered by the skunk, but Sally stops the confrontation, noting that their plane has been caught by Dynamac. Despite the need to act quickly, Geoffrey wants them to wait until his crew stop the train. If they wait too long, Dynamac will destroy the train and them with it. Sally returns to NICOLE for advice, as it has been going over the data it retrieved earlier and located some weaknesses: it can't anticipate actions and that it can be deactivated with an electric pulse to it's CPU. Before they can react, Dynamac grabs Sally with one of its arms, so Geoffrey prepares to take action, claiming to be quicker than Sonic. Sonic detests to that, but reacting before Geoffrey, trying a spindash again, but getting shocked by Dynamac and being thrown back into the car. Geoffrey takes his turn, firing his gun and launching an electric net at Dynamac. The electricity of the net, however, is not enough and doesn't affect the robot. With both of their initial options exhausted, they need to decide another plan. They put their differences aside and decide to take the fight outside and head for the train's roof. While climbing up, Sonic reveals a little device he got from Rotor that can scramble the robot's electronics. He tells Geoffrey to be ready while he distracts Dynamac to free Sally. He enters into a spindash again and changes his target to the robot's arm that is holding Sally. His attack works and Sally is freed, captured by Geoffrey below. Sonic runs out of the reach of Dynamac, hoping that Rotor has a plan of his own. Luckily, he does, as he orders Antoine to convert the plane to vertical mode, to draw attention away from Sonic. Antoine does so, causing the engines to convert to a vertical flight mode. Hitting full thrust, the force turns the robot's attention away from Sonic, so it can keep its grip on the plane. Sonic takes the opportunity and runs onto the back of the robot, inserting the device he showed earlier into the Dynamac. He activates it, causing the electronics in the robot to scramble. Geoffrey lets out a signal, getting the attention of his group from the locomotive. They aim their weapons at the Dynamac and fire, destroying it with ease. With the robot gone, they stop the train. With the threat of the Dynamac gone, the plane lands and the group decides to make the most of the situation by salvaging parts from the train for their own use. Sally and her group decide to take some equipment while Geoffrey will take the train itself. They share a goodbye kiss, raising questions between Tails and Antoine. With the plane almost ready, they decide to board, but Sally and Sonic both stay quiet about the kiss. As they prepare to board, Sonic thinks that Sally is just trying to get him jealous...but he has his own plans up his sleeves. With the Chaotix missing, Knuckles is the sole remainder, tasked with finding them himself. He places blame on himself, but knows that Archimedes is responsible for their disappearance. He treads the ruins he's in slowly, thinking that his nemesis is hiding in the shadows, laughing at his efforts to find him. A camera pops up from one of the ruins and follows Knuckles. From an unknown location, a hidden being watches Knuckles with the cameras, commenting that he still doesn't understand the big picture. Continuing on, not realizing what is under his own nose. Rotor is fast asleep in his bed, when he is abruptly awaken by a radio beside his bed, with somebody yelling his name. He gets up in a sweat, looking at the radio, thinking he was dreaming that it was working. Sonic and Sally arrive quickly, having heard his scream from being awaken by surprise, asking about the problem. He tells them that he had a nightmare, thinking that his old radio was working, when it has not worked for years. As an antique, he kept the radio for sentimental reasons...until it activates again, with the person on the other side of the radio yelling for help. Rotor drops the radio in shock, realizing that it is working, and that the voice on the other end of the radio is his mother. They decide to go to the lab to see what's up. In the lab, Rotor sets up his radio to a monitor display to determine where the call for help came from. He pin-points the call for help from north Mobius, one of the last pristine areas on Mobius. Sonic thinks though, that with Robotnik around, it may not be so. Rotor requests permission to head out to help his family, which Sally quickly and unrelentingly allows. Sonic offers to join along, but Rotor would rather go about the mission alone as it involves his family. As he leaves, Sonic looks to Sally, but she agrees with Rotor. Rotor arrives in a sub-aquifer airlock, where his Bathysphere submarine sits, waiting for use. Using the submarine, Rotor navigates a complex undersea canal to get to the cold north (the canal is a maze that the reader can figure out). He arrives, surfacing the Bathysphere and popping out of the hatch, instantly remembering the Frozen North Sea from his childhood. He moves the sub further inland into the glaciers and anchors it, deciding to swim the rest of the way. He arrives at the main ice floe, seeing many of his fellow walruses, including his family. He quickly runs up to his mother and brother, but they don't respond. He waves his hand in front of their eyes, realizing they are in a trance. He looks around at the whole herd, noticing they are all in the same trance. Suddenly, a voice booms over the group, a voice that Rotor recognizes. The voice orders all the walruses to enter a secret chamber in the iceberg, or they will be clubbed by icebots, SWATbots with ice for heads. The walruses mindlessly march toward a door guarded by icebots. To get more information, Rotor pretends to follow the lead and walks into the iceberg in a trance-like state. Once inside, the door is sealed shut as he realizes his initial thoughts were correct: Robotnik has taken over his herd. Robotnik is visible on many large monitors in the chamber. He reveals that he had detonated a neuron bomb over the colony, rendering their brains frail. With his efforts, he will have control of the Frozen North Sea. Robotnik originally had a plan to use the walruses to flood the planet, but he came up with another idea. He wants to use the walruses to help him freeze the entire planet. He orders the group to reply with an amen, which they all do, minus Rotor. One of the icebots notices the lack of reply by Rotor, clubbing him with a wooden club and ordering him to speak louder. Rotor replies to the clubbing in a normal way, gathering the attention of Robotnik, who realizes the true identity of Rotor, ordering the bots to capture him. With his identity busted, he runs away, knocking a bot over onto a button to open the chamber door. He escapes, trying to get into the water. Robotnik orders one of the icebots to club him, so it throws its wooden club at Rotor. It hits him while he's at the edge of the ice floe, knocking him out and causing him to fall unconscious into the water. Unlike past issues, Robotnik does not appear in the main story. His only appearance in this issue is in the last two pages on a monitor. Rotor's family members, Rotor's Mom and his brother Skeeter, are introduced. The plane used by the Freedom Fighters is an upgraded version of the plane shown in issue 25. Geoffrey St. John returns, appearing for the first time in the regular comic series. It is also the first time that Sonic and Geoffrey St. John meet, starting a rivalry over Sally's heart that will span many future issues. Sonic quotes the Transformers catchphrase "more than meets the eye" while the Dynamac-3000 transforms. The Bathysphere submarine was last seen in Sonic mini-series 1.